Sometimes it's the subtle things that win me over. Sure this has cool packaging, but one little detail is all it took for me to toss this into my cart. Notice anything different between these two flavors? On the right, we have little gum-ghosts blowing bubbles shaped like blueberries, which just so happens to match the flavor of the candy inside. The peach gum-ghosts? They're blowing normal balloon-shaped bubbles. Why is that? Because if they were blowing up peaches it'd look like they were blowing up pink-hued bubble-butts...or worse. Part of me wishes they hadn't of caught that (the evil part), but my graphic design background wants to commend their design-team and their foresight. As it turns out, everything about this packaging is incredibly thoughtful. 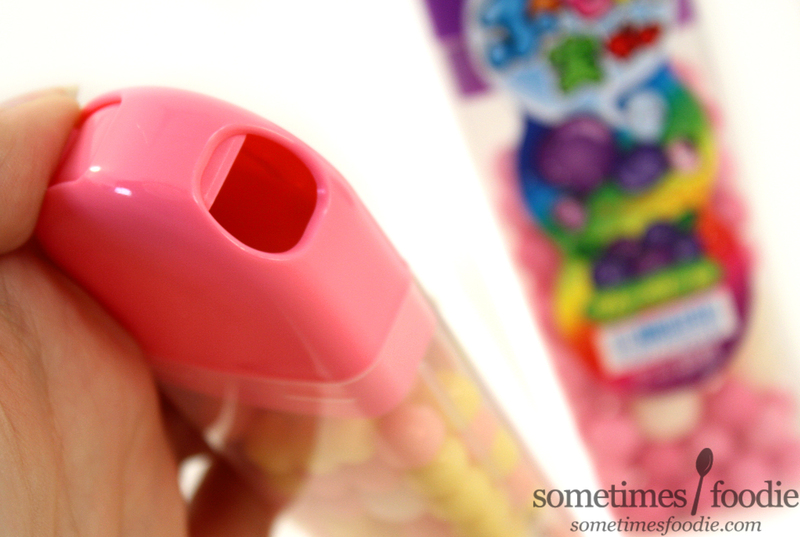 These tiny, multicolored, fruity gumballs are inside pocket-sized plastic dispensers. The dispensers are made of two plastic parts, the colorful solid plastic top with an easy to use pull-lever opening the dispenser, and the clear plastic containment portion. Although the two parts fit snugly into one another, it feels like the stickers are what really hold things together. Kind of like Tic-Tac packages. Each container, with it's smooth rounded edges, feels great in-hand, and the colorful illustrations warm my black little heart. Just look at all those white shiny bursts! Sadly, most of the illustrations are printed onto the clear plastic wrapping, not the actual container, so when that first layer of plastic is removed, these get a lot less cute. Bummer. A little how-to guide to use the container! Completely unnecessary, but that little Pac-Man-Head getting his tongue stuck is illustrative gold. 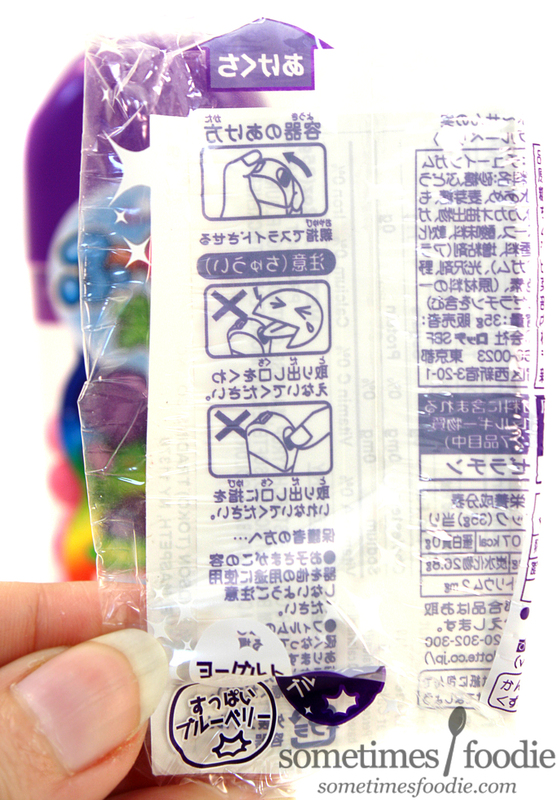 You really don't need the instructions and warnings, but I guess they had to make sure they covered their butts from any mis-use lawsuits. 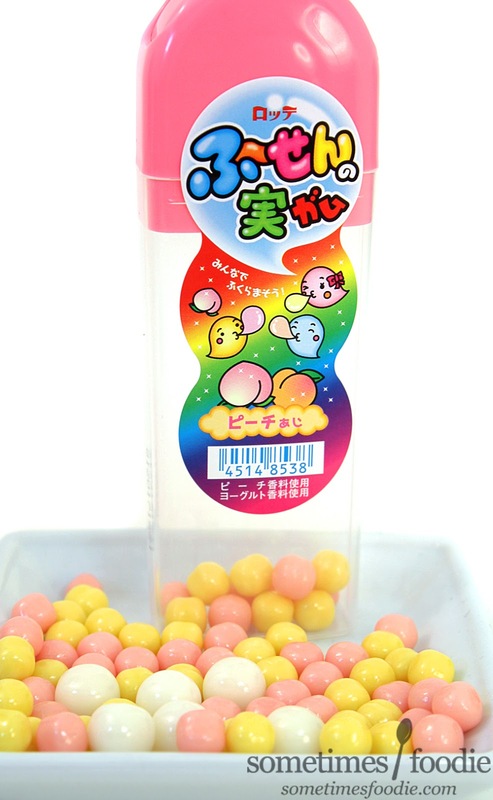 Speaking of butts...let's give the peach candies a try! 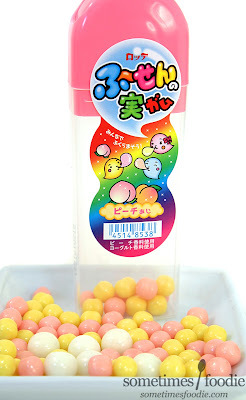 Peach: The peach candies vary in size, whith larger off-white cnaides and smaller yellow and pink ones. They don't seem to have any scent, but they do look rather peachy. Initially the peach flavoring is bold and bright. It's far more artificial than authentic, but it's immediately recognizable. The chew is very soft and bouncy, not great for bubbles, but it's quite enjoyable for mindless chewing. However, the flavoring just doesn't last. 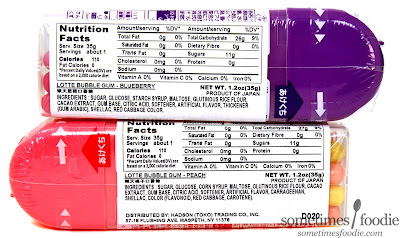 You get a minute or two of sweet fake peach flavoring and than it fades into sugary-rubber-nothingness. I found myself adding more and more gumballs to chase the flavor-dragon. The texture is still pretty fun, but the lack of flavoring gets old pretty quick. 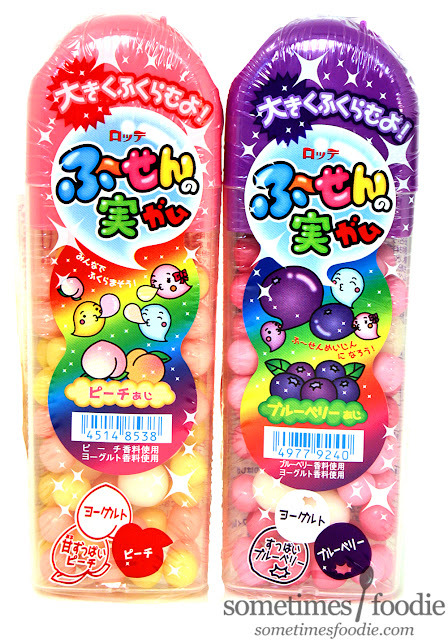 Blueberry: Again we have the larger off-white candies, but this time we have small lavender and pink candies in the mix. Guess they're going for a more natural blueberry look instead of the bright cartoony blue a lot of American sweets opt for. Unlike the peachy ones, these do have a subtle fruity scent although it's not that distinct. This take on blueberry isn't all that authentic, but it is very interesting. 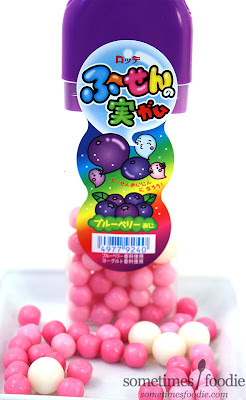 The gum has a tangy deeper berry flavoring that makes me think of blackberry preserves, but much brighter and more artificial. Almost like a black raspberry version of rock candy. Actually, I think this is reminding me of that weird blueberry drink from IKEA I reviewed ages ago. (Way back in 2012!) Maybe its more authentic than I thought? 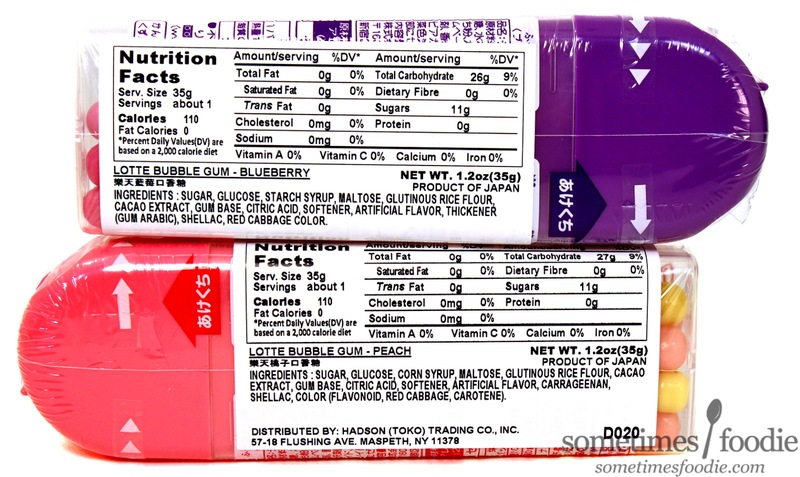 The flavoring is more complex than your average chewing gum, but texturally it is the same as the peach and it suffers from the same short flavor-life-span. Still it's a unique flavor that I am really enjoying. The lack of longevity might be a deal breaker for some, and I admit that the imported price tag means you will definitely not get the best bang for your buck, but I would throw frugality to the wind and buy these again in a heartbeat. (I still buy packs of Fruit Stripe gum too!) Sure, the flavoring is fleeting, but the soft rubbery chew is still enjoyable while working at my desk, and even though I know I'll never catch it...I'll never stop chasing the fruity dragon. Are there any plans to continue a podcast like Candyology 101? I used to listen to that podcast religiously.